Once you have searched for and successfully identified a number which you would like to purchase, we can move on to the number_order endpoint. This endpoint will allow us to actually purchase a number. So, lets navigate to the number_order endpoint. You'll find it under the "MISSION CONTROL API" heading on the left hand side of the API docs. We use requested_numbers_with_metadata when ordering specific numbers with specific requirements. The metadata that you send is meant to satisfy local requirements associated with numbers purchased e.g a local address. If no local requirements exist, as is the case for US numbers, you can simply enter in the numbers by themselves. 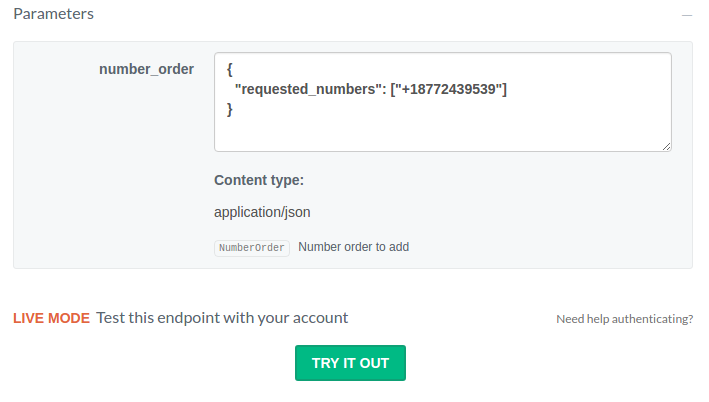 We can use requested_inexplicit_numbers when ordering unspecific numbers. You'll pass along the inexplicit search results of the numbers you wish to purchase, plus a quantity and, optionally, an address_id. One you have prepared your JSON body, simply copy&paste it into the "Parameters" text field and click "TRY IT OUT". In the example below, we are doing a requested_numbers number order. 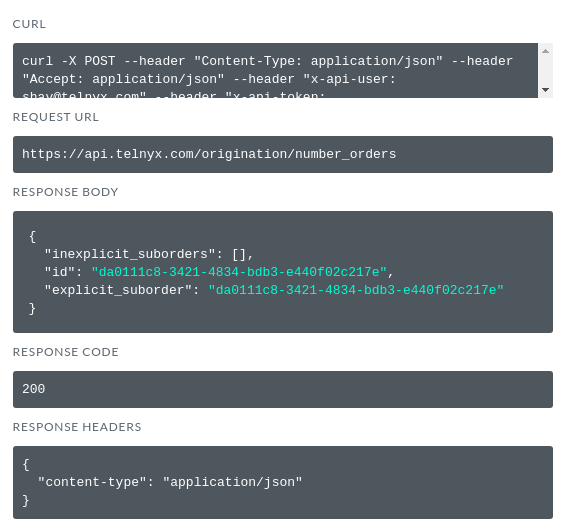 Below we can see a snippet of the JSON response with our order ID. Congratulations! You have successfully purchased a number using our Mission Control API.